The Chrysanthemum throne is said to have been passed down over 125 generations, from the time of Emperor Jinmu. If Japan allows women and imperial family offspring of female lineage to become emperor, it would fundamentally change the history of imperial succession. One of the characteristics of suc-cession in the Japanese emperor system is that it gives less precedence to descendants of direct lineage. Most European monarchies hand down the throne via direct lineage. The British royal family, which gives precedence to male heirs, also basically values succession to members of direct lineage. By contrast, in the Japanese emperor system, when there are only women in the immediate family, the baton is passed to a male heir of a related family. Although it is natural for an emperor to want his own child to take over the throne, the system does not allow it. The lineage is maintained not only by the emperor's immediate family but also with the cooperation of other families. At the core of the practice is the idea that the throne does not personally belong to the emperor, but is something that he received from his predecessor, and must pass down to the next generation. Ties and cooperation between brothers and generations of the imperial family are all the more important in maintaining the lineage given that direct lineage is not always given precedence. The immediate family of any given emperor is not automatically allowed to monopolize the throne. The extended imperial family as a whole acts as the imperial family, which gives rise to harmony. Thus, the succession method of esteeming the first Emperor Jinmu and ancestral accumulation is what is characteristic of Japanese imperial succession, which is not direct lineage but male lineage. 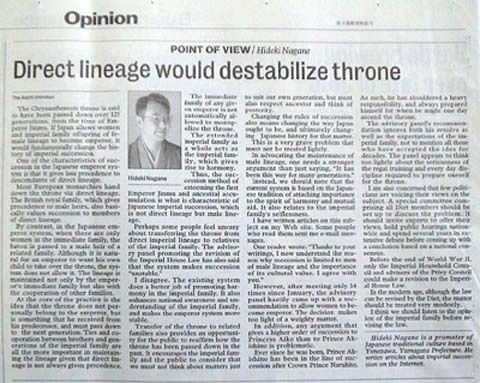 Perhaps some people feel uneasy about transferring the throne from direct imperial lineage to relatives of the imperial family. The advisory panel promoting the revision of the Imperial House Law has also said that the system makes succession "unstable". I disagree. The existing system does a better job of promoting harmony in the imperial family. It also enhances national awareness and understanding of the imperial family, and makes the emperor system more stable. Transfer of the throne to related families also provides an opportunity for the public to reaffirm how the throne has been passed down in the past. It encourages the imperial family and the public to consider that we must not think about matters just to suit our own generation, but must also respect ancestor and think of posterity. Changing the rules of succession also means changing the way Japan ought to be, and ultimately changing Japanese history for that matter. This is a very grave problem that must not be treated lightly. In advocating the maintenance of male lineage, one needs a stronger argument than just saying, "it has been this way for many generations". Instead, we should note that the current system is based on the Japanese tradition of attaching importance to the spirit of harmony and mutual aid. It also relates to the imperial family's selflessness. I have written articles on this subject on my Web site. Some people who read them sent me e-mail messages. One reader wrote: "Thanks to your writings, I now understand the reason why succession is limited to men of male lineage and the importance of its cultural value. I agree with you". However, after meeting only 14 times since January, the advisory panel hastily came up with a recommendation to allow women to become emperor. The decision makes too light of a weighty matter. In addition, any argument that gives a higher order of succession to Princess Aiko than to Prince Akishino is problematic. Ever since he was born, Prince Akishino has been in the line of succession after the Crown Prince Naruhito. As such, he has shouldered a heavy responsibility, and always prepared himself for when he might one day ascend the throne. The advisory panel's recommendation ignores both his resolve as well as the expectations of the imperial family, not to mention all those who have accepted the idea for decades. The panel appears to think too lightly about the seriousness of the regal training and every day discipline required to prepare oneself for the throne. I am also concerned that few politicians are voicing their views on the subject. A special committee comprising all Diet members should be set up to discuss the problem. It should invite experts to offer their views, hold public hearings nation-wide and spend several years in extensive debate before coming up with a conclusion based on a national consensus. Before the end of World War II, only the Imperial Household Council and advisers of the Privy Council could make a revision to the Imperial House Law. In the modern age, although the law can be revised by the Diet, the matter should be treated very modestly. I think we should listen to the opinion of the imperial family before revising the law. Hideki Nagane is a promoter of Japanese traditional culture based in Yonezawa, Yamagata Prefecture. He writes articles about imperial succession on the Internet. I receive a mail in Japanese.